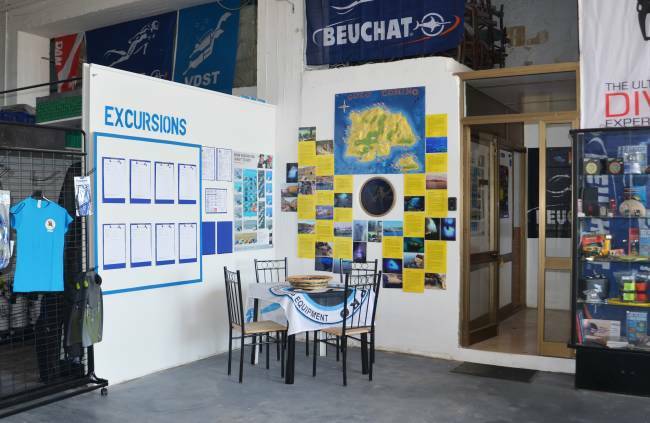 Since 1st of April the gate of our dive centre in Mgarr Gozo is open again but its premises are hard to recognize. As promised, we have spent our winter renovating, so we have quite some surprises in store for our repeater guests and are looking forward to welcoming our first time guests in a more comfortable and convenient place. What’s new? To soothe your stay with us on Gozo, we have not only created a colorful info-corner, new seating accommodation and a bar, but also expanded the equipment, wet and storage space and finished it off with a little color, some plants and decoration. Next to our manager Christine, known faces like Ermes, Ben, Nico and Julia will welcome you this year and will get further support from our two gifted linguists Doris and Toni, who can brief and teach you in uncountable languages. Ermes, Brandon and Simon will also offer “Extended Range” courses this year. We are looking forward to diving with you and hope for a great season 2017!